The sophisticated and exclusive system made of elastic strips allows a perfect girth-pressure-distribution. As a direct consequence, the horse’s complaints when being girthed are reduced significantly (e.g. kicking, biting, refusal of the girth). Its special design allows the horse to expand its chest when needed during exercise. The elastic rings expand and contract with the rib cage, maintaining a uniform tension. A comparative study of various girths certifies: All horses, without exception, maintained lower heart rates when using the Equi-Soft-girth. An important advice: To correctly use the girth, the centre of the girth must be positioned symmetrically on the horse’s centre. Never adjust only one side. The tension needs be equal on both sides. This product managed to be a finalist at the Spoga Horse Innovation Award 2012. The unique design allows the girth cover to be changed within seconds. 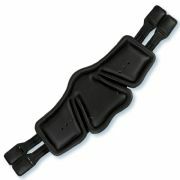 The Equi-Soft-girth is available in black, ebony and tobacco. The lengths vary from 45 to 140cm and the girths pads are available in Vachette leather, neoprene or lambskin. Please allow 2-3 weeks for delivery as we order in this product from Germany.